Gone. That’s what the Ken Griffey Jr. poster in my bedroom simply read while he posed after his signature swing. Gone. Well, now he’s back. Ken Griffey Jr. was it for me. Like many others who grew up in the 90’s, it didn’t get any better than Junior. The Mariners were my team, even ahead of my hometown Brewers at the time. A-Rod, Randy Johnson, Edgar Martinez, Jay Buhner, Joey Cora, Norm Charlton, but most notably was Junior. I had all the baseball cards, the shirts, the N64 video game, the jerseys, the batting gloves and even the spikes…with the big Nike swoosh in Velcro across the laces. Ready I was. I made sure the batteries in the camera were charged. I made sure the memory card was empty. I made sure I got all my work done super-fast. Then came the call. After working in baseball media relations for 5 minutes, it’s hard to get star-stuck. You realize that the players are just “guys” and just like you and me…except they get to play baseball everyday. 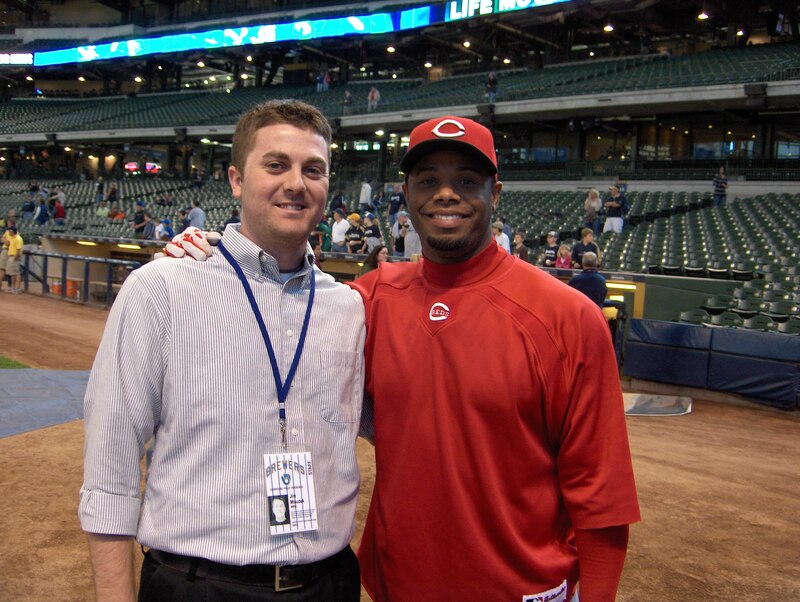 But meeting Ken Griffey Jr. was one of the few times I had to step back. Standing next to me was my favorite all-time baseball player. I grew up watching his every move. I tried to emulate his swing (even though I was right-handed). I had his posters up in my room. Here he was, shaking my hand. Although I wish that Junior would’ve signed with Atlanta so I would’ve had the chance to see him come through Cincinnati this year, I’m glad he’s back with Seattle. It just seems right. He’ll get more at-bats with the DH and knock out a few more homers…followed by that classic pose. Enjoy the homecoming Seattle, I’ll be reliving the glory days right there with you. Good Griffey Tribute, definitely shows how much of a fan you really are of the game.